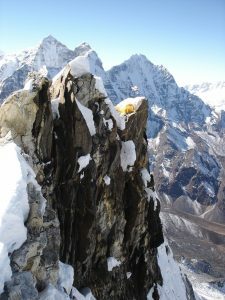 The world’s highest osteopathic treatment? 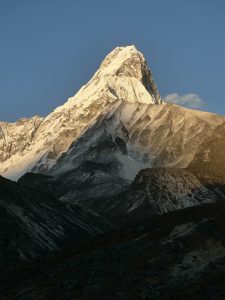 Ama Dablam is a stunning 7000 metre-high mountain situated in the Everest region of Nepal (2 kilometres higher than Mont Blanc). 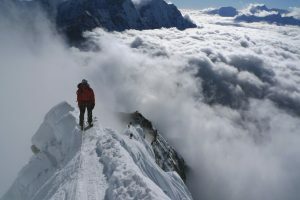 Also known as the “Matterhorn of the Himalayas”, this pointed mountain is technically demanding and requires 2 weeks of acclimatisation before a bid for the summit is attempted. Even before we had left the Nepalese capital Kathmandu our osteopathic skills were put into use treating members of the expedition team for plantar fasciitis and a torn calf muscle – all from over-training in preparation for the climb back in the UK! Lukla is the starting point for most expeditions in the Everest region. After a rather hairy helicopter flight into this village, due to bad weather, we spent 5 days hiking up to Ama Dablam Base Camp. Luckily most of our climbing kit, ropes and down suits were taken up by yak as the altitude gain each day make even moderate walking slow and breathing a real effort. At base camp (4570m) our services were called upon to treat one of our team, Emma who had started to get severe back pain and sciatica from her heavy rucksack. Not what you want before a week of high altitude climbing. With treatment 3 times a day and strong medication and muscle relaxants from the team doctor, Emma was fit enough to start the climb. 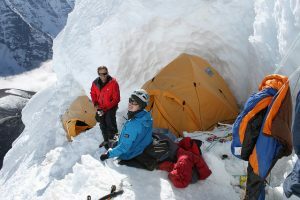 On our return from a night at Advanced Base Camp, we found that word had spread we were osteopaths and climbers from nearby expeditions came over to ask advice about various aches and pains. They came with an eclectic range of problems from shin splints, knee strains, to a dislocated shoulder sustained whilst abseiling! Back up on the mountain it took us five days to advance to Camp 3 before heading for the final summit push. Sleep was hard to come by as it was extremely cold (-20 oC) and at the last camp we only had 46% of the oxygen concentration found at sea level at home in Bristol. Combined with strange “Cheyne Stokes” breathing patterns (where the body stops breathing for short durations so you then wake yourself up gasping!) and tents perched precariously on piles of rocks, this did not make for ideal sleeping conditions! We were all getting ready by 5am on summit day to melt snow on the stove for drinking water, pack kit and put on our down jackets, big plastic mountaineering boots and crampons. Camp 3 was perch just on the side of a large snow ramp with a 1500m shear drop only 2 metres away from the tent entrance. 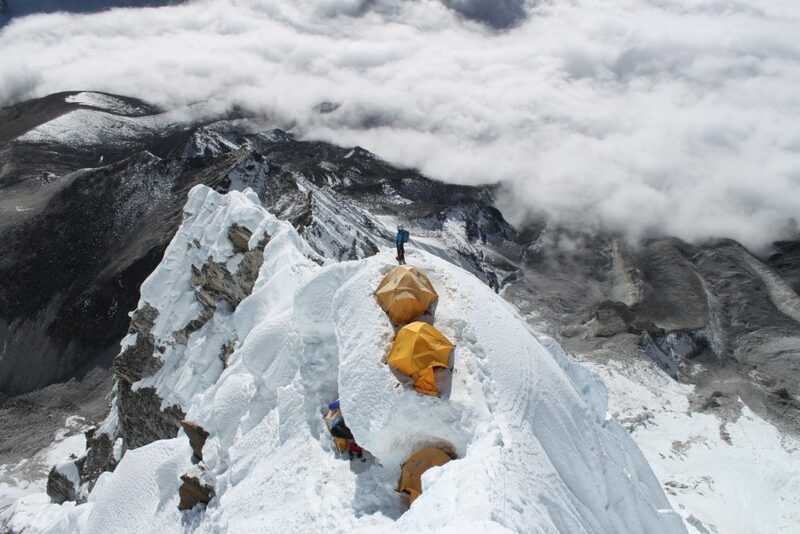 Bonita, who has summited Everest, shouted from their tent that Emma had ‘cricked her neck’ and couldn’t turn her head. I struggled out of our tent, clipped onto the ropes and went to see what had happened. Emma had had a poor night and had finally fallen asleep at 3am with a waterproof jacket for a pillow. She had woken with an acute torticollis facet joint lock in her neck. It was hard to treat as space was extremely tight, Emma didn’t even want to remove her hat as it was so cold and I didn’t particularly want to take my gloves off either for fear of frost-bite. Luckily we were able to manipulate the joint and get movement back into her neck. Not bad at 6500m, in the dark, at -20 oC with half the normal oxygen levels. Was this the world’s highest osteopathic treatment?! Summit day was epic – physically and mentally the hardest thing we have ever done. 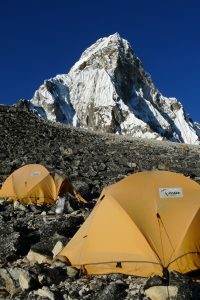 After spending one more uncomfortable, luckily uneventful night at Camp 3 we descended all the way to Base Camp the next day. Although all down, the physical effort and concentration was still exhausting, not to mention the impact on the knees as we made the long trek down. Luckily we all had walking poles and the relief of getting safely off the mountain seemed to carry us most of the way. We arrived in Base camp to freshly cooked food, water and a cold beer. Mountaineering and osteopathy duties completed!